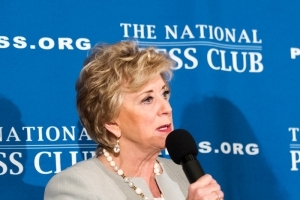 Small businesses already are seeing positive results from the recently passed tax cuts as well as regulatory reform, said Small Business Administration administrator Linda McMahon at a National Press Club Headliners Luncheon May 17. Congress passed the Tax Cuts and Jobs Act late last year to cut the tax rate for businesses and individuals, among other things. And at the luncheon, McMahon said she has heard from small businesses that they have more customers and more revenue because of the cuts, and as a result now are able to expand and hire more employees. "Small businesses are absolutely benefiting from these tax cuts,” she said. “They are making investments, they are expanding and they are creating jobs." President Donald Trump appointed McMahon after she founded the World Wrestling Federation – now known as World Wrestling Entertainment – with her husband Vince, and spent time as president and CEO. She twice ran for the U.S. Senate in Connecticut, in 2010 and 2012, but lost both times in the general election after winning the Republican nomination. McMahon said that some of the current rhetoric from Democrats on Capitol Hill who have called for repealing the tax cuts is worrying. And she said that while the legislation has been criticized in some quarters for lowering the corporate tax rate from 35 percent to 21 percent, small businesses will continue to benefit from the reduction. Lowering taxes is "not a zero-sum game," she said, because corporations are investing too. That means, she said, that "entire local economies can be formed around small businesses supporting a large corporation." McMahon said while Washington may have a reputation for gridlock, especially in an election year, she has felt supported at all levels of government and that her work has not been affected by the partisan tumult that has dogged other areas of policy. "Washington is frequently described as a dysfunctional town where nobody wants to work together,” she said. “I can tell you that is certainly not the case at SBA, it's not the case among the various committees with jurisdiction in both the House and in the Senate. There is truly a bipartisan atmosphere focused on improving what this agency does every single day." "This surge in small business optimism and everything that flows from that did not happen just by accident,” she said. “It's not the result of some cyclical realignment. It's not happening because of public policy decisions that were made years ago. It is happening, I believe, as a direct result of this President's leadership. Both the tone and the policies coming out of Washington are different."